At one time Lions were found from Greece through the Middle East to northern India, but today only a very small population remains in India. In the past they lived in most parts of Africa, but are now confined to the sub-Saharan region. They can be found in savannas, grasslands, dense bush and woodlands. These cats produce a unique vocalization which may be produced by all adult members of the pride. Roaring is the loudest sound uttered by any cat, recorded as loud as 114 decibels, and can be heard from a distance of up to five miles. They devote an inordinate amount of time sleeping, especially at midday on the plains, once having found the shadow of an acacia tree. 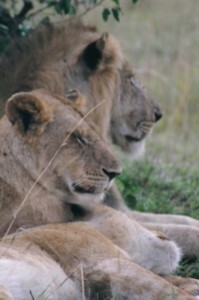 After consuming a full meal, the pride may spend the next 24 hours just resting and digesting their meal. When resting, all seem to enjoy good fellowship with lots of touching, head rubbing, licking and purring. But when it comes to food, each animal looks out for itself. 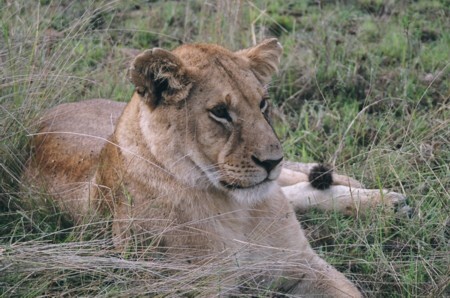 Females do 85 to 90 percent of the pride's hunting, while the males patrol the territory and protect the pride, for which they take the 'lion's share' of the females prey. 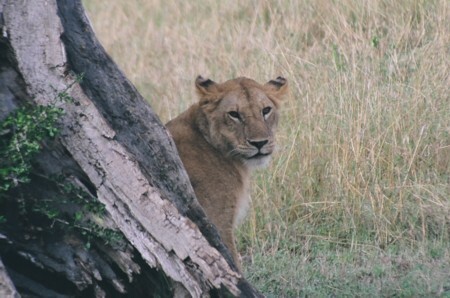 Lionesses not only assume the responsibility of hunting for the group but also care for the offspring. Within the pride, the territorial males are the fathers of all the cubs. When a female is in heat, a male will join her, staying with her constantly. The pair usually mates for less than a minute, but it does so about every 15 to 30 minutes over a period of four to five days. Females generally come into estrous by the age of 2 1/2 to 3 years and continue to have litters every two years, if an adequate food supply exists. At the end of the 105 day gestation period, the lioness leaves the pride to seek out a sheltered isolated area to give birth to her litter of two to four cubs, as a matter of safety to the cubs. The cubs are born blind, weighing from three to four pounds, with a soft wooly grayish-yellow or pale brown coat variously market with spots or stripes. Some mothers carefully nurture the young; others may neglect or abandon them, especially when food is scarce. 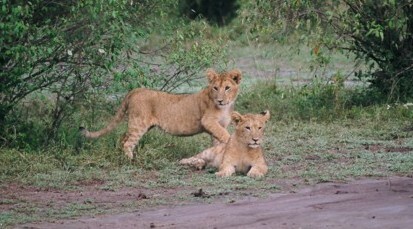 Usually two or more females in a pride give birth about the same time, and the cubs are raised together. A female will permit cubs other than her own to suckle, sometimes enabling a neglected infant to survive. Capable hunters by 2 years of age, they become fully grown between 5 and 6 years and normally live about 13 years. 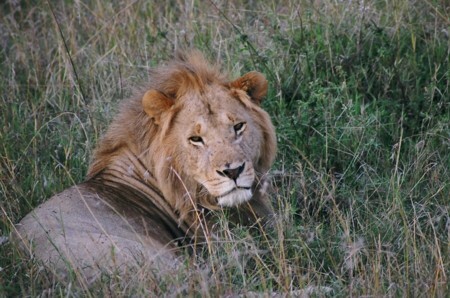 Male cubs begin to show visual signs of sexual maturity by the age of twelve months (mane), but only begin to exhibit true adult male behaviors about the age of 30 months. Mature males are unique among the cat species for the thick mane of brown or black hair that encircles the head and neck. Of all the great cats, the lion has always held a supreme place in man's esteem and imagination. The legacy of the 'King of Beasts' as the model throughout history is demonstrated by its appearance among the earliest drawings made by humans over 15,000 years ago. Note: The Swahili Name is Simba. The Scientific Name is Panthera leo. The weight ranges from 275 to 500 pounds, with females being only slightly smaller than the males. The diet is, you will guess right, carnivorous. Predators: Humans! !